Oracle Marketing Cloud is the digital marketing platform that marketers love and IT trusts. It simplifies digital marketing by providing one place for marketing teams to connect data, orchestrate experiences and optimize interactions for each individual customer. Built on an open platform, Oracle Marketing Cloud connects with hundreds of apps, data and media providers that brands use today. Our Eloqua consultancy has many years of experience supporting customers so we’re perfectly positioned to help marketers who are just starting out on their Eloqua journey, to early adopters who are looking to push the boundaries of their marketing automation and demand generation activities. Furthermore, being an early adopter of Eloqua marketing automation technology, we support customers across North America as well as Europe executing globally and locally. 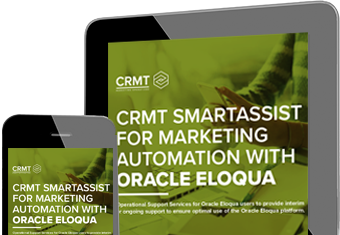 As a marketing operations consultancy and Eloqua Partner, CRM Technologies can support your organization across the full spectrum of Oracle Marketing Cloud solutions. We specialize in Eloqua Marketing Automation for which we offer Eloqua consulting, technical implementation & support services, managed campaign configuration & delivery services as well as best-practice and solution consulting. "CRMT laid the foundations for their accelerated growth and changed the perception of marketing within the company, right up to executive and board level due to the visibility and insight that the Eloqua platform provides." Journey from marketing automation to marketing awesomeness by downloading your free eGuide today. Our step-by-step guide takes you right the way from your very first steps in adopting marketing automation through to transforming your department and delivering the goods to sales.